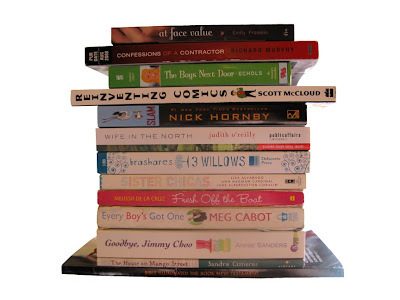 Pop Culture Junkie: This Week In Books Or How I Almost Hit A Dry Spell, Almost! This Week In Books Or How I Almost Hit A Dry Spell, Almost! So nothing until Thursday this week! Figured it would be a 2-3 book week but you know me, of course not! In the mail I got 3 Willows (AHHHHH!) and Bible Illuminated! Friday: In the mail I got Wife in the North. Saturday: Confessions of a Contractor came from a very generous Librarything member! Thank you! I also got a postcard in the mail letting me know the copy of At Face Value I ordered for in-store pick up was ready! I was going to ask when I was at Borders last night and then I got distracted by some sweet little Buddas near the checkout line. Darn it! So I just got back from picking that up! You crack me up. So many books, but I'm addicted as well...so I understand. OHH I want 3 Willows. How exciting! Lucky lucky you. I got Dead Boys in the mail this week...and I think that was it. It was busier last week or the week before, I believe. You make me feel good about what I got since my pile's not as big as yours. What a great week in books for you! It sounds like you've been waiting for *Slam*, I hope you enjoy it. The only Nick Hornby I've read is *A Long Way Down*. Anyway, The Boys Next Door and Every Boy's Got One are great! I missed my local libraries sale last week. I doubt they would have had much though. Or at least that's what I'm telling myself. At Face Value was quite cute, fluffy. Like a rom-com. shooting stars mag- Heheh! I just want to read all of my books at the same time! dawn- I have been waiting for Slam! I've read a few of his Non-fiction books, none of his fiction yet though. veens- I'm glad you liked it! gabbi- LOL! I'm so excited for At Face Value! J. Kaye- Very! Yesterday started the week with a bang, 3 packages! What a busy week for you, or at least at the end. That's how mine was. I absolutely love library sales! Happy reading! anna- I'm going to the library book store today after work. It definitely gives me something to get really excited about during the week!